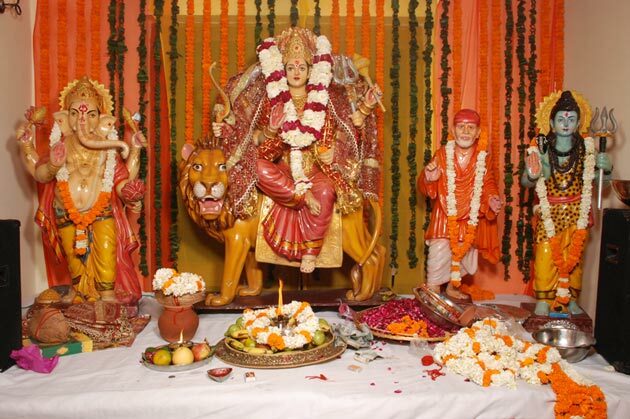 Mataji or Durgaji is worshipped alongwith other deities of Hindu religion and custom. This event takes place at chosen locality by devotee who wants to organize this event. Organizers undertake this event from 7pm and till 10pm in the evening. This devotional event marks the Hindu religious and spiritual worship without the need to go to either pilgrimage or holy city or temple. A number of devotional songs and prayers are offered to the deity including most rituals of worship like the Yagna and Puja. Devotees at this spiritual event which is almost similar to visiting shrines, holy temples and other places recorded in Hindu scriptures as benefitting to spiritual and devotional life of an individual. Mata Ki chowki is a divine graceful evening for all who want to attend. People from the cities and towns organize this event for bringing devotional and bhajan sandhya for all. This is a popular event which marks the vision of enabling spiritual upliftment to those who seek deity Durgaji's protection and goodwill. Her favor and blessings in turn lead individual to come through darkness, evil and thrive in her benign kindness. Bhajan sandhya is a remarkable event with lots of songs and devotional music being played for visitors and followers to benefit. These visitors learn to have better perspective to things in life, with peace and numerous spiritual activities. Her blessings and stories following those written in the scriptures are very popular with spreading goodwill and lots of entertaining for all at the event. These stories are in praise of deities at this event, while offerings made by devotee to the deities marks a special occasion for developing fervor and spiritual growth. A higher purpose from spiritual value places a lot of religious and devotional fulfillment in life for those who follow this path. This devotional event is affordable and within your budget, while taking less time to complete as well.